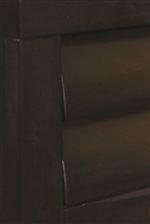 This elegant bench not only adds beauty to your home but also a little old tradition feel. 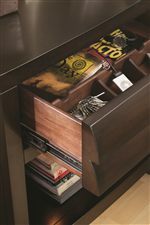 The spacious 1 drawer can be used to hold clothing or other personal accessories and the 2 open compartments can be used to hold books, magazines, and other types of media. lace this at the foot of your bed to help accent the entire room. The Tangerine 1 Drawer, 2 Open Compartment Bench by Pulaski Furniture at AHFA in the area. Product availability may vary. Contact us for the most current availability on this product. 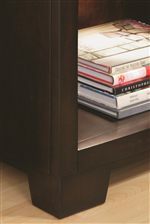 The Tangerine collection is a great option if you are looking for Casual furniture in the area.